The new Masterflex L/S Cytoflow pump head minimizes the impact on live cells and shear-sensitive fluids. 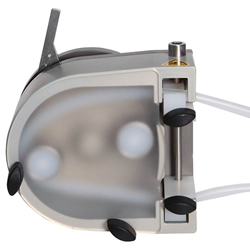 The new Masterflex L/S Cytoflow pump head was developed specifically for pumping live cells and shear-sensitive fluids. The pump head is ideal for use in biopharm and microbiology applications and performance in live-cell applications has been verified by independent test data. The Cytoflow pump head has a large-diameter rotor resulting in high flow rates at low motor speeds. The pump head is available in 2- and 3-roller configurations—two-roller heads offer higher flow rates, three-roller heads deliver less pulsation. The pump head is compatible with all Masterflex L/S drives that accept two or more pump heads. In addition to the high flow rates at low motor speeds, the Cytoflow pump head has a convex roller design, furthering its cell viability advantages. This combination makes the Cytoflow pump head the best choice for pump operators looking to minimize the impact on live cells and to maintain the consistency of shear-sensitive fluids. Cole-Parmer has been a leading global manufacturer and distributer of fluid handling products, instrumentation, equipment, and supplies since 1955. Our portfolio including popular brand names such as Masterflex®, Ismatec®, Oakton®, Digi-Sense™, Environmental Express® and more, are sold around the globe through direct sales, multichannel marketing outlets, and a strong network of international dealers. Cole-Parmer also features an ISO-17025-accredited metrology lab for instrument calibration and repair. Cole-Parmer responds with excellence to customer needs, and offers application expertise and technical support. For more information, contact Cole-Parmer, 625 East Bunker Court, Vernon Hills, IL 60061. In the US, call 1-800-323-4340. International customers, call 1-847-549-7600.